What email server software is running your business?? Thinking of making the jump to Microsoft Office 365? Is it the right choice for you though? Historically Microsoft Exchange Server was the only option for your email. With the emergence of Office 365 in 2011 you can now opt to keep all of your data in the cloud on Microsoft’s dedicated servers. You do not need to install and maintain an on site email server but it comes as a subscription. Although Microsoft still offer Exchange, they are no longer promoting it in the SME space, preferring for people to take out their subscription based services. There are pro’s and con’s to both methods, ultimately it is your decision… here is some information to help you to make that decision. Software Costs- Microsoft Exchange Server has a large outlay for the initial product. However that is also not the only cost. Your server needs to be compatible with the minimum specs required by the version of Exchange you would like to use, some of these specs may require an upgrade to your server others may warrant a total replacement. Also the software version will not last forever, Microsoft bring out new versions of Exchange every four years or so with new features, and if you’d like to move to these you will need to buy your licence again. Office 365 is based one a subscription fee. It works out cheaper in most cases than buying Exchange Server depending on the number of staff you have using it. Security – Exchange does not come with an advanced spam filter as standard, you will either need to buy Microsoft’s or a third party’s option at an additional cost per user. Anti Spam is more important than it’s ever been with Ransomware rife at the moment which can erase and steal data from your server. Also whatever your hardware outlay in terms of firewalls and safe guards your data will not be as secure as if it is on Microsoft’s own servers which is the case in Office 365. So much so Hiscox and other insurance companies are starting to offer Cyber and Data policies for companies wanting to take out insurance to protect against Cyber Security breaches. Server size– Microsoft Exchange is an Office based system, which is accessed and utilised though an server. Depending on the size of your business, you will need to have a physical server on site sorting and storing your data. With all of your data in one place, you need to have a contingency plan such as backup and data recovery which is often costly and can be difficult to deploy. Office 365 is a cloud- based service. This means that you can reduce the size of your onsite server. Your emails are safer in the cloud. They are protected against natural disaster and malware. Microsoft also offer safety in the instance of power cuts and fires. They will always have a backup recovery plan with all of your data. Also Microsoft guarantee a 99.9% uptime of your email which is financially backed by them. Updates- With Exchange you can decide and schedule your own updates. 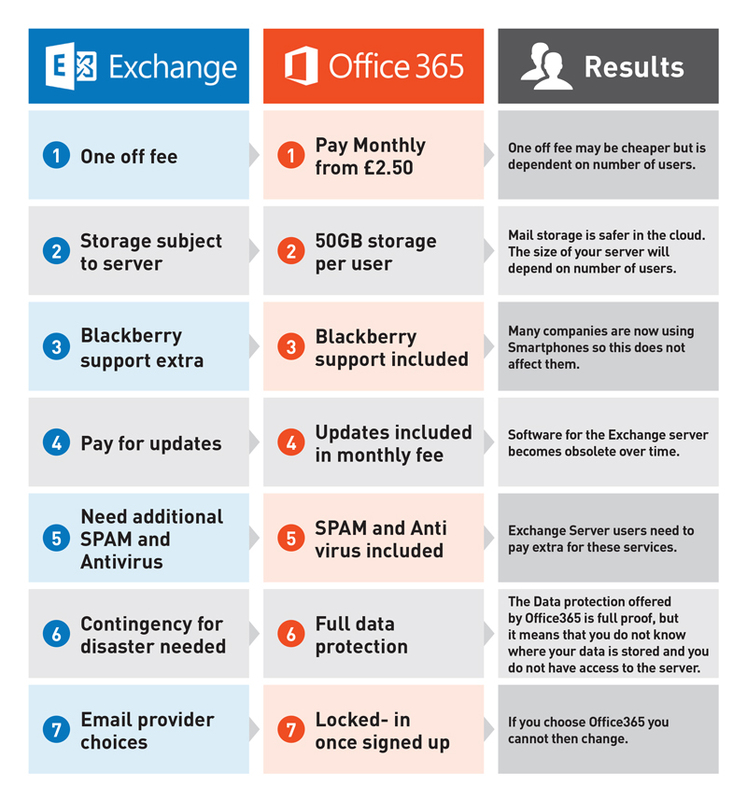 It is your choice and control the options and changes ie when a new version of Exchange Server comes out you do not necessarily have to upgrade to the latest version, saving you money on the licencing and hardware costs. You will need to keep up to date within reason however, as your version will become obsolete at some point. With Office 365, the updates will happen when Microsoft decide, which may cause some disruption, but ultimately you will always have the latest version of any service. The upgrade will also be included in your subscription, no need to worry about updates affecting your budget. Office 365– With your Office 365 subscription there are some extra’s to consider. Each user gets 50GB of storage. The email can be synched to Blackberry as well as smartphone. Blackberry support is also inclusive of the monthly fee, not extra as it is on Exchange. You can also use your subscription to add Word and other Office licenced apps to your smartphone. In face you can use it on 5 laptops and 5 smartphones per licence. Exchange Server– The control over your data is completely transparent with Exchange. You are able to easily add third party plug in’s as you control the server. If your company does not use Blackberry, they will not benefit from the inclusive Blackberry support. You will still have 24/7 telephone support. If you are happy with your server and IT support, you may have difficulty making the change. You may need to go through a Microsoft Service Provider to get the full support that you will need. If you make the decision to move across, make sure you are 100% certain as once you have it, you cannot go back. Although it may save you money, in the long term is it the right decision to move to Office 365? There are so many factors to consider, only you can make the choice for your business. 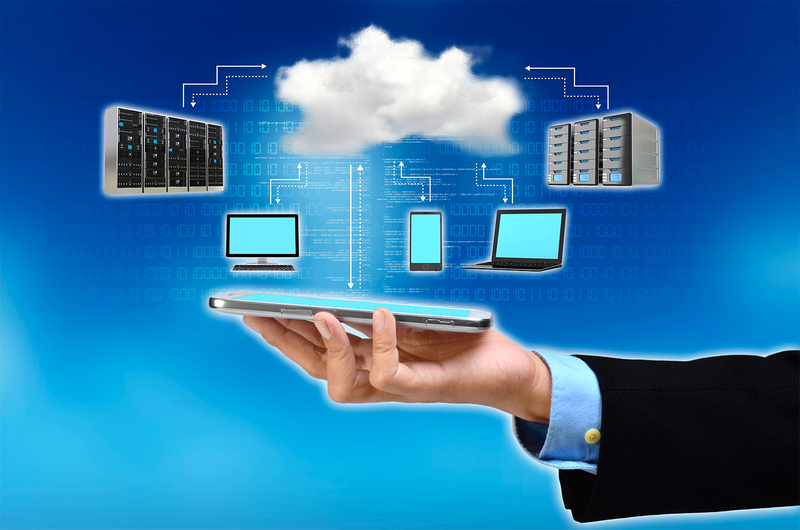 If cloud based technology is the future, it is only a matter of time until we are forced to make the change? It is hard to move with the times, especially when we become set in our ways, maybe dragging our feet is only a sign with our discomfort with new technology. To lease the latest technology for your business, speak to one of our helpful sales team on 0207 111 163 or sales@hardsoft.co.uk. We have specially tailored server and network packages to get your business running on a larger scale. A 5 PC network starts at as little as £39 +VAT per week or 5 Apple iMacs from just £49 +VAT per week. Our Server leases also start at as little as £9.95 +VAT per week for the HP ProLiant ML150 Tower. We can supply everything you need, including Office 365. With all HardSoft leases, you can enjoy the benefits of FREE warranty, technical support and one of our famous freebies.